First off let’s explain the difference between sorbet and sherbet (please refrain from calling it sher-BERT). Sorbet contains no dairy – typically a mixture of fruit, fruit juice and sugar. Sherbet contains some form of dairy – typically milk, cream, or a combination so it’s lower in fat than ice cream or gelato. I simply love the sweet-tart mixture of berries and lemon in this recipe – the creaminess of half and half mellows out the acidity just enough. This is a pretty forgiving recipe. I’ve made it with 1/4 cup of lemonade instead of lemon juice and it works well both ways. If you want to it prevent it from getting too icy – you can add 2 tablespoons of light corn syrup in place of the same amount of sugar. In a large bowl, whisk ingredients together. Transfer to an ice cream maker. Mix according to the manufacturer’s suggestions, until thick and frosty (about 20 minutes). Transfer to a freezer-safe container and allow to harden in the freezer for at least 4 hours. Store in the freezer for up to one month. 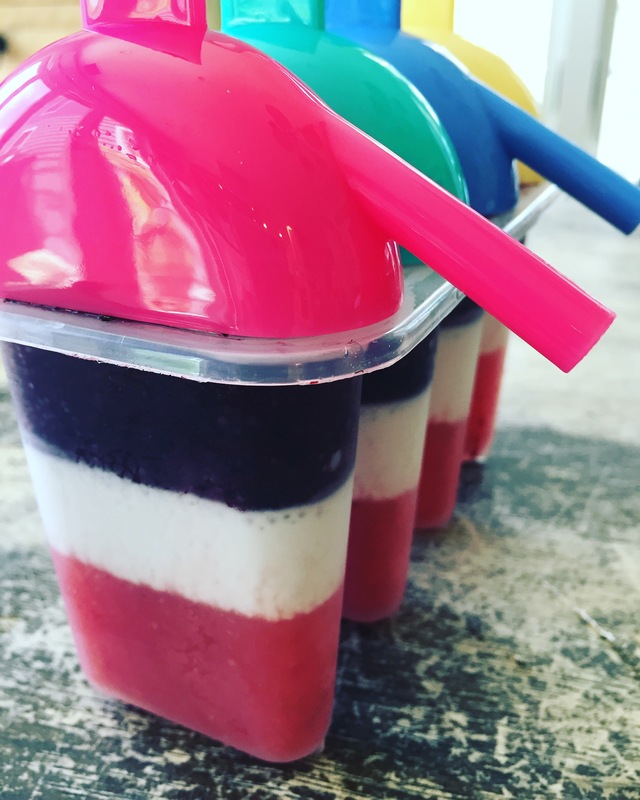 Unbelievably yummy and super cute – these ice cream treats might just be the family favorite of the summer. 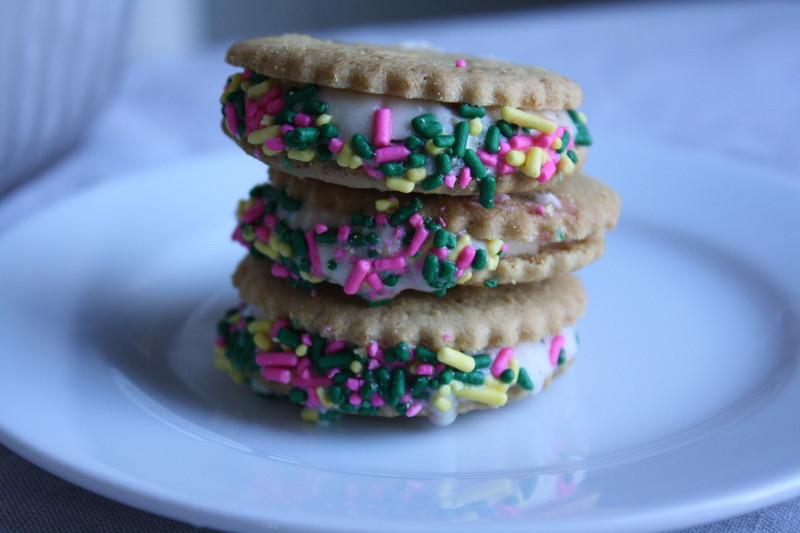 Use any combination of small cookies and ice cream for this easy recipe. Trader Joe’s Cookie Thins are the perfect size and texture. Roll in sprinkles, mini chocolate chips, or chopped nuts for some added crunch. Place 12 cookies (flat side up) on a flat surface. Top each cookie with 1 tablespoon of ice cream, top with another cookie and press gently until ice cream reaches edges of the sandwich. Roll in sprinkles and place in a freezer safe container for at least 1 hour to harden. My girls love to make smoothies for breakfast but we always have some left over. While they don’t get very exited about keeping them in the fridge for later on – freezing them on a stick has a totally different appeal. This should make enough to fill 6 standard popsicle molds, plus leave with some extra for sipping. 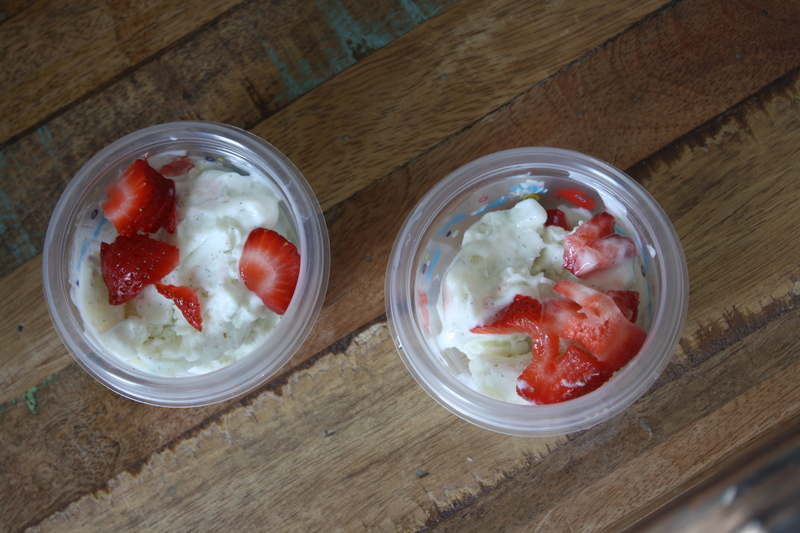 Making homemade fro yo is so incredibly simple and you’ll skip over all the processed ingredients found in store-bought containers. 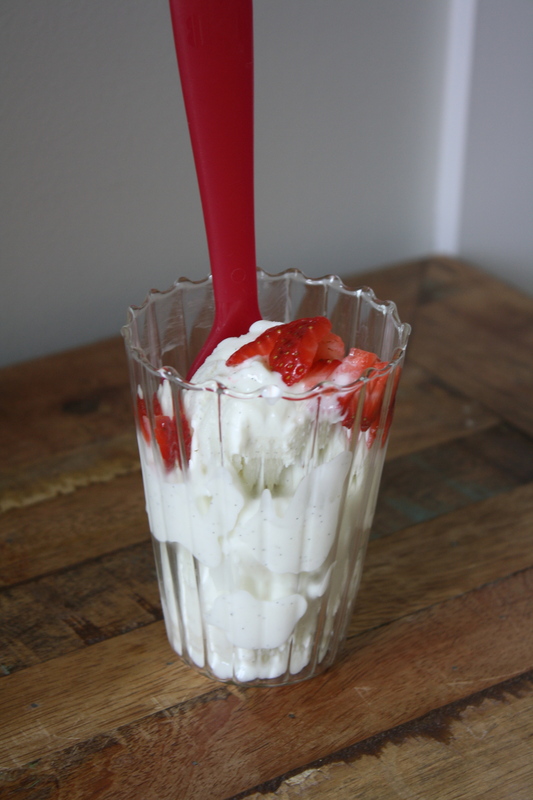 Start with 1 1/2 cups of 2% Greek yogurt and mix with 1/2 cup of any flavor regular yogurt. 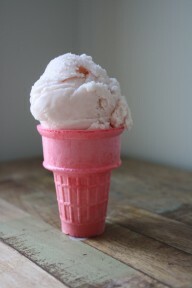 Whisk in 1/3 cup superfine sugar* and run in a ice cream machine for 10 minutes. Enjoy the softserve-like version right away or allow to harden for 2 hours in the freezer before serving. Store for up to 2 weeks. 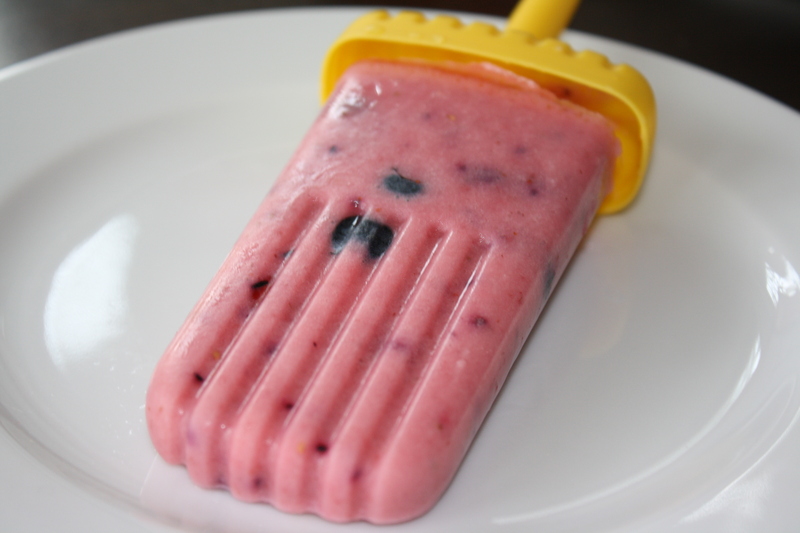 The best part of the creamy cool confection —there’s only 110 calories and 5 grams of fat per 1/2 cup serving. 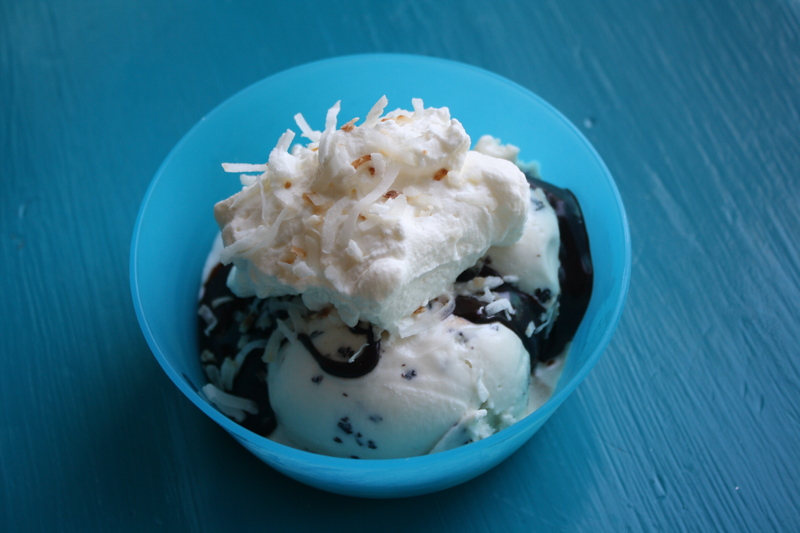 In honor of National Ice Cream Day – the fam and I put together this special treat.